I received an email yesterday informing me about a documentary called “Spirit of the Marathon II” that is coming to theaters for one day only on June 12th. This documentary follows the journey of seven different marathon runners from six different countries to the finish line of the Rome Marathon. They come from all walks of life and each face different challenges both physical and emotional along the way. “Spirit of the Marathon II” is a project put together by marathon runners, accomplished filmmakers Jon Dunham (director) and Gwendolen Twist (producer), three-time Academy Award® winner Mark Jonathan Harris (executive producer) and Academy Award® nominee Megan Williams (producer). The film’s producers, NCM Fathom Events and movie theater circuit partners AMC Entertainment Inc., Cinemark Holdings, Inc. and Regal Entertainment Group—will be donating a portion of the proceeds from this event to The One Fund Boston. “In the sea of humanity at the start of every big city marathon, each individual has reasons to run that go beyond 26.2 miles,” said 25-time marathoner Dunham. “It is our intention to bring these stories into focus with the ‘Spirit of the Marathon’ documentaries,” said Twist, who recently qualified for the prestigious Boston Marathon. Julie Weiss – Veteran Marathoner – At the Rome Marathon, Julie began a quest to run a marathon a week for a year to honor the memory of her father on an emotional journey to spread awareness and raise money for pancreatic cancer – the devastating disease that claimed his life. Ylenia Anelli – First-time Marathoner – While struggling to keep her mom-and -pop running shoe store open in Milan and raising two children, Ylenia takes on the challenge of training to run her first marathon. Vasyl Matviychuk – Olympic Marathoner Hopeful – The elite marathoner trains with the pride of country in his heart in hopes that a fast time at the Rome Marathon will earn him the last spot on the Ukrainian National Olympic Team. Mimmo Scipioni – Veteran Marathoner – The good-natured, hard-working owner of “Pizzeria Il Podista” (The Runner Pizzeria) in Rome, Mimmo has lined his pizzeria’s walls with photos and trophies from the more than 40 marathons he has run. It is a pre-race tradition for runners to carbo load with Mimmo. For Mimmo, the family tradition of running the Rome Marathon is in jeopardy due to a nagging injury. Domenico Anzini – Veteran Marathoner – Prodded by his cousin Mimmo, it took a lot of convincing for Domenico to give running a try. 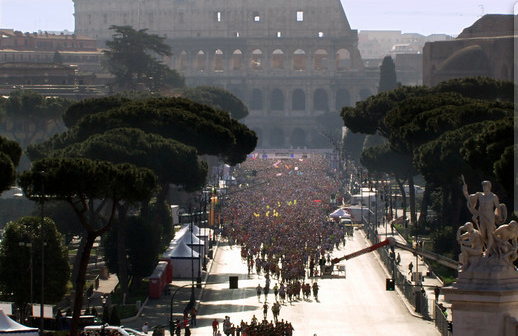 Now, 18 years later, the 73-year-old has run in every Rome Marathon since its inception. The camaraderie and humor the cousins share during their training runs goes to the heart of family. Cliff Scott – First-time Marathoner – Scott’s bucket list decision to run his first marathon in his 60’s is an inspiration unto itself. When faced with an unimaginable family tragedy he struggles to make peace with himself during training runs in the woods. It is painfully obvious that his loss has taken its toll and calls into question whether he will be able to finish the Rome Marathon. Epiphanie Nyirabarame – Two-time Olympian – One of the few professional runners in Rwanda, Epiphanie proudly represents her country around the world to create change for women. Having been deeply affected by the genocide in 1994, Epiphanie uses her resources to invest in her community, advocating for progress and growth, especially for the future generation of runners. NCM Fathom Events teamed with Dunham, Twist, Harris and Wasserman Media Group in 2008 to bring the documentary “Spirit of the Marathon,” which chronicled the journey of six runners in the 2007 Chicago Marathon, to hundreds of U.S. movie theaters, many of which sold out. The documentary has emerged as a cult favorite in the running community. As a runner, I think that this sounds like it will be a very inspirational and awesome documentary! It is showing at select movie theaters on June 12th at 7pm local time. Go here to find out where it is showing in your area. Did you see the first “Spirit of the Marathon” documentary? If so, what did you think? By Tempie at June 7, 2013 . Thanks for sharing! I can’t wait to watch this! Dan and I often go for runs in new cities that we vacation/travel to; however, I was 16 weeks pregnant when we went to Rome. I didn’t want to take a chance of having to seek out emergency care in a foreign country should something go wrong with the pregnancy, so Dan and I just walked (up to 12 miles a day!). I look forward to watching this, and even more so of going back to Rome one day!